Months before President Obama signed the Affordable Care Act on Tuesday, March 23, 2010, professionals in the insurance industry rushed to devour any news, gossip, and rumors they could latch on to. One of the most knowledgeable and powerful forces for educating consumers and professionals rested in the National Association of Health Underwriters. 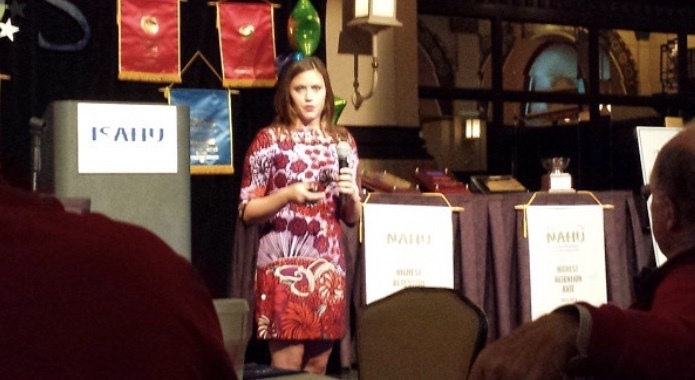 And one weekday morning a NAHU presenter spoke to a room of Central Indiana professionals about the ACA. When Kristen Kaweck entered the room she realized, “I don’t know what is happening.” As luck would have it, neither did anyone else in the room. Kaweck, now 28, works with Houston-based Tokio Marine HCC in their Indianapolis office. In a post-ACA world that increasingly bends toward diversity of talent and background, Kaweck represents a new generation of powerful, young, urban women in an industry men have long dominated. “A lot of people probably thought I wasn’t going to last very long,” she says. Fresh out of Michigan State University in 2012, HCC (before being acquired by Japan’s Tokio Marine in June 2015) scooped her up to be a Social Media Marketing Intern. The three-month stint gave her a buzzword-heavy title and the daunting task of making HCC friendlier to other young professionals seeking insurance. When more attention focused on the healthcare and health insurance sectors in the US than any time since World War II, the work kept coming. After an internship extension and through the mentorship of long-time NAHU member Mike Watts, they hired Kaweck as an Account Executive. The ACA did not spell doom for NAHU. But the Health Underwriters have not been immune to the malaise in membership and professional association enrollment that has washed over the country. What probably started as early as the 60’s or 70’s with the advent of television came to a head for most organizations, clubs, and private membership organizations in the 90’s as millions eschewed Rotary, Kiwanis, Lions, and professional associations. The Internet’s allure and demand for remote connectivity have kept millions more out of breakfast connections and luncheon presentations through the 2000’s. Yet it’s for these reasons Kaweck saw reason to join Health Underwriters. “It’s always fun to take on a challenge. Bucking the trend is what I was hoping to do — and to encourage more people to do the same because it’s so lucrative,” says Kaweck. “The insurance industry has so many options, especially in technology, to advance. You can sell insurance online and people are just now realizing how successful you can be. People see health insurance and they think of this old-school process. When you see an old-school process, that’s where there’s an opportunity to get involved and succeed,” she says. Kaweck’s foresight helped secure her a spot on the Indiana State Association of Health Underwriters board in 2014, first as a technology advisor and later as a marketing chair. “We took on the task of redeveloping our website, driving people to that site, and I feel I contributed to and hired the people to provide that presence online,” she says. She also taught Continuing Education courses about social networking for agents and brokers looking to make new connections with customers. Her offline connections with Health Underwriters helped secure early presentation gigs around Indiana, Florida, and in Scottsdale, Arizona at the annual NAHU National Convention in 2014. Now a year away from earning her MBA, Kaweck wakes up every morning a little surer of what’s going on around her. As the industry has wrapped its hands around the Affordable Care Act, she’s already looking ahead to the next set of challenges and opportunities for sales and outreach. And unlike many predictions to the contrary, she’s shown she’s capable of sticking around for longer than a few months.